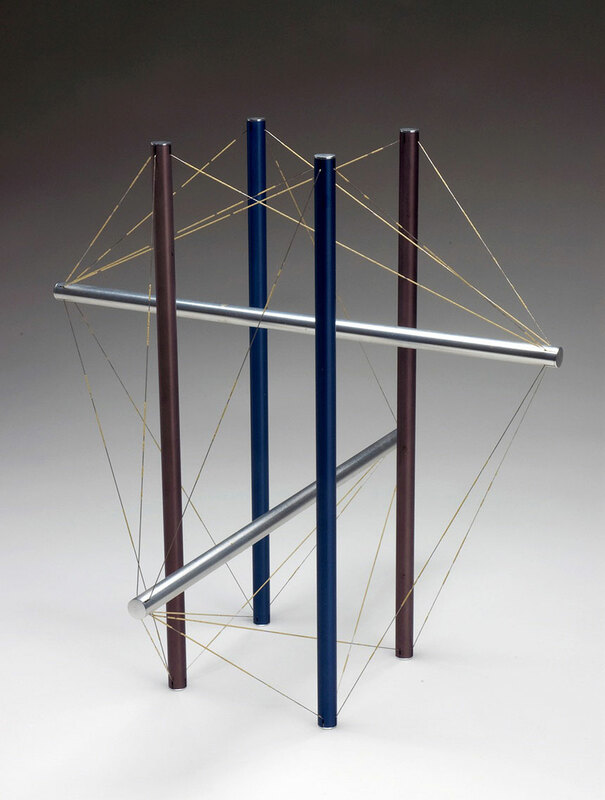 As a child in Pendleton, Oregon, Kenneth Snelson loved to build model airplanes and ships, activities that anticipated his success as a sculptor of carefully engineered steel and aluminum pieces that conveyed, in the artist’s words, “the wondrous essence of elementary structure.” After finishing high school, he enlisted in the United States Navy, working as a radio technician and in naval intelligence in Washington. Following his discharge, he took advantage of the GI Bill and enrolled at the University of Oregon, where he pursued architectural drawing and design. In 1948, Snelson attended the summer session at Black Mountain College. Noting the young man’s “aptitude for three-dimensional design,” Josef Albers guided him toward the experimental architect and faculty member Buckminster Fuller. Initially, the two men’s relationship was very compatible, and Snelson recalled being “electrified” by Fuller’s first lecture. That fall, Snelson returned to study engineering at the University of Oregon and then returned to western North Carolina for a second summer. He brought with him a kinetic model of plywood pieces suspended one over another by nylon tension lines, a piece he called Early X Piece. At Fuller’s instigation, the design was translated into metal and christened “tensegrity”—a combination of integrity and tension—and subsequently exhibited as Fuller’s own work. Snelson went on to attend the Institute of Design in Chicago, an American offshoot of the Bauhaus, but found it lacked the conviviality of that he had experienced at Black Mountain. For a short period, he studied in Paris with Fernand Léger, a noted modernist who often painted floating figures. Snelson settled in New York after that and worked for a time as a cinematographer for television documentaries, while continuing to make small sculptures. In 1964, he was commissioned to create a major aerial piece measuring thirty by thirty-five feet for the public utilities pavilion at the World’s Fair in New York. Although his work was represented in important museum exhibitions (including the 1966 Sculpture Annual at the Whitney Museum of American Art), critics often accused Snelson of being more an engineer than an artist. He responded in turn: “Engineers make structures for specific uses, to support something, to hold something, to do something. My sculptures serve only to stand up by themselves, and to reveal a particular form such as a tower or a cantilever or a geometrical order probably never seen before.” He developed a specialty of airy public outdoor sculptures constructed of stainless steel and aluminum, which illustrate his theories of compression and tension. He held five United States patents, and in 1999 the International Sculpture Center presented him with the Lifetime Achievement in Contemporary Sculpture Award.